As cross country races go, we couldn’t have asked for a finer day than that which heralded the final meeting of the season: wind, rain hail… and mud! All credit to Ben Allberry of Kent College Pembury for allowing it to go ahead (it wasn’t actually raining at 11am when he had to make the call! ), and awe, admiration and credit in abundance to the children who stood shivering on the start line, ready to compete. The course at Kent College is tough on a good day: run over farmland, with a taxing uphill climb of a good 150m just before the final sweep to the finish, the children had to run with an extra kilogram of mud stuck to the bottom of their boots – this was not a race to attempt in trainers! First away were the U9 girls, Mrs F wondering whether she would be accused of child abuse as she made them strip off their hoodies at the start (they needed something vaguely warm and dry to put on at the end), sending them off with advice to ‘tuck in behind the one in front when running into the (gale force) wind’! Those little girls were so brave, not least because the ‘hare’ made a mistake and led them around the U11 course. First to cross the line was Mischa W, in a fantastic 8th place, followed in the four-to-score team by Jemima W (who has had a wonderful season), 13th, Lucienne SD (our Y3 star)20th, and Daisy A (battling through)27th. 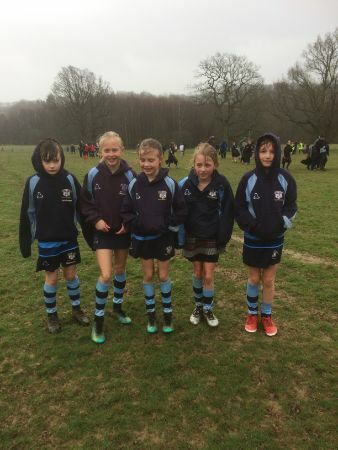 The girls came third of nine in the U9 race – a fantastic result. Alice M (29th)is to be credited with a huge display of resilience… she didn’t want to run, but she did it!!! You did yourselves proud girls – well done!